Volvo Trucks have long been recognized for performance, innovation, and value. While smart styling, productivity-enhancing electronics, and comfort-laden cabs may be the most noticeable features, perhaps more innovation goes into making these products a value. Cost and weight reduction drive automotive engineering, maybe more so than in any other industry. Charged with reducing both, Volvo Truck engineers teamed with RTP Company to develop some inventive material solutions. Federal Motor Vehicle Safety Standards (FMVSS) mandate a grab handle, allowing access to truck cabs. In the case of Volvo, the handle is made of aluminum and mechanically fastened to cab side L-shaped faring brackets. 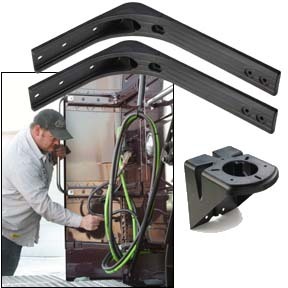 These brackets are injection-molded of an RTP 4700 Series glass-reinforced polytrimethylene terephthalate (PTT) compound, previously banded steel was used for this application. Another bracket made of the same material holds a roof mounted satellite dish. Both brackets were identified for replacement as cost reduction candidates. The handle was subject to testing under a 250 pound (113 kg) load, necessitating a bracket tensile strength of at least 18,000 psi (124 MPa). Its prominent placement required that the brackets exhibit a quality surface, which allows the brackets to be top coat painted (requiring no primer) to control costs. Further, shrinkage rates of any replacement material would have to correspond to those of the existing tool. The satellite bracket called for a flexural modulus of at least 1.4 million psi (9653 MPa). Since this bracket didn’t require painting, both performance and finish would have to withstand the rigors of the open road—mandating broad chemical and UV resistance. Jason Spence, Volvo Product Design Engineer, explored options with RTP Company and settled on the RTP 4700 Series PTT compound. PTT is a semicrystalline polyester, closely related to the more common thermoplastic polyesters, PET and PBT, but typically less expensive. The selected RTP 4700 Series compound contains both a UV protection package and glass fiber reinforcement. With a tensile strength of 18,000 psi (124 MPa) and a flexural modulus of 1.4 million psi (9653 MPa), the material passed all load testing. Though reinforced, the part exhibits a smooth, resin-rich surface acceptable as a stand-alone finish and suitable for one coat painting. Volvo Trucks, North America manufactures Class 8 trucks and tractors from their headquarters in Greensboro, NC. For more information visit their website at www.volvotrucks.com.